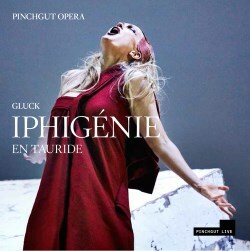 Pinchgut Opera is the kind of company which renews one’s faith in the chances of pre-Romantic era opera continuing to be staged by companies which provide modern, innovative performances in period style and presented to a very high artistic standard while maintaining respect for the integrity of the works themselves. The orchestra and singers here draw on native Australian talent which performs worldwide but has been gathered in Sydney to deliver performances which have received critical acclaim. The period-instrument orchestra, playing at A=430 Hz and thus somewhat lower than the standard modern pitch, numbers only 36 but makes a hefty, well-tuned sound; it starts very promisingly by giving a rousing account of the splendid opening storm, the playing underpinned by a very audible, buzzing harpsichord which adds dramatic edge and a welcome sub-stratum of harmony. There are only twenty voices in the excellent chorus but their singing is gutsy and the playing of the ten violins is never clipped, finicky or under-powered; only in the scene between Oreste and the Furies do I feel that there is a certain lack of heft and propulsion and things temporarily go off the boil. Enthused by that opening, I became even more engaged upon hearing the first notes from the eponymous protagonist, Caitlin Hulcup. She is up against the strongest possible competition from other singers able to bridge the soprano-mezzo gap, with superb recordings from singers like Callas, imperious in a role ideally suited her vocal and histrionic gifts but singing in Italian and recorded in mediocre live mono sound from 1957. Others who have made a success of Iphigénie include Régine Crespin, Sena Jurinac, Rita Gorr, Marilyn Horne and, more recently, Carol Vaness and Susan Graham, all of whom saw in the role a part which permitted their voices to shine. Hulcup may hold her head high in such exalted company; she has a big, warm, rich mezzo with a lovely fluting timbre. Her vocalism is thrilling, flawless and frequently reminiscent of her distinguished senior compatriot, now retired, Yvonne Minton; her singing of “O malheureuse Iphigénie” is a highlight. She is worthily supported by a singer of similar vocal characteristics in mezzo-soprano Margaret Plummer, singing three roles. What a pity, then, that the male singers here do not match those two in vocal artistry. The bromance between the devoted pair of Oreste and Pylade is depicted by two singers whose voices are both afflicted by vibratos which militate against the classical poise of Gluck’s elegant, passionate and streamlined score. Christopher Saunders’ tenor evinces a pronounced bleat and a tonal constriction sadly all too typical of too many modern tenors. He makes heavy weather of the lovely aria “Unis dès la plus tender enfance” and is really feeble in “Divinités des grandes âmes”, making one long for John Aler in Gardiner’s seminal 1985 recording or Gösta Winbergh in a superb live-composite recording for Muti at La Scala in 1992. Grant Doyle as Oreste is better, being stronger of voice but his top is strained, the dreaded wobble obtrudes too quickly on sustained notes. He cannot float a note or maintain legato like his erstwhile teacher Thomas Allen, a superlative Oreste for both Gardiner and Muti. The other two basses are adequate if a bit blustery and Nicholas Dimitropoulos’s French is not very idiomatic or convincing, whereas the rest of the cast cope very well with a language notoriously hard to sing. The sound is first class – just a little swish from the air-conditioning – and the presentation of this 2 CD set is ideal: a neat cardboard digipack with a booklet enclosed providing a plot synopsis, a French libretto with an English translation, performer biographies and colour photographs of the production as it was staged in the City Recital Hall. How I wish I could welcome this wholeheartedly as a vital, thrilling account of a great masterwork which remains under-performed; unfortunately, the relative inadequacy of the male singing compromises its worth and I would first suggest either of the two recordings referred to above and conducted by Gardiner and Muti, even though Hulcup’s Iphigénie is something to hear and hear again. I look forward to encountering her voice in future performances and recordings.